Snorkeling Honolua Bay is great. It is one of the few sheltered bays to snorkel on Maui, and offers a wonderful short hike through stunning forest, and diverse sea life. 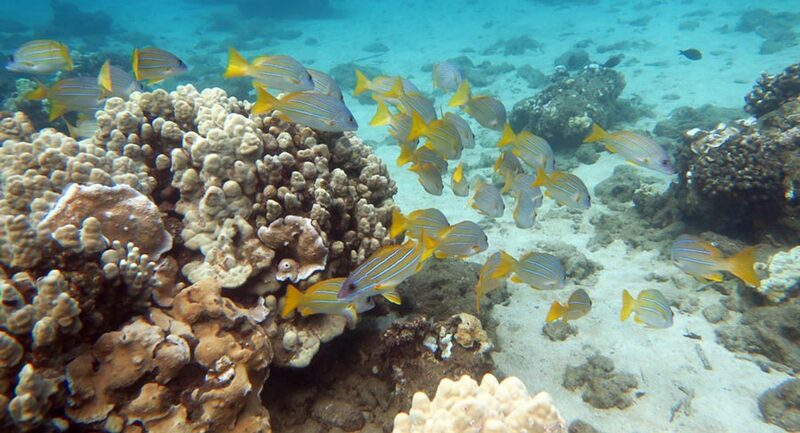 The waters here are part of the Honolua-Mokule’ia Bay Marine Life Conservation District. 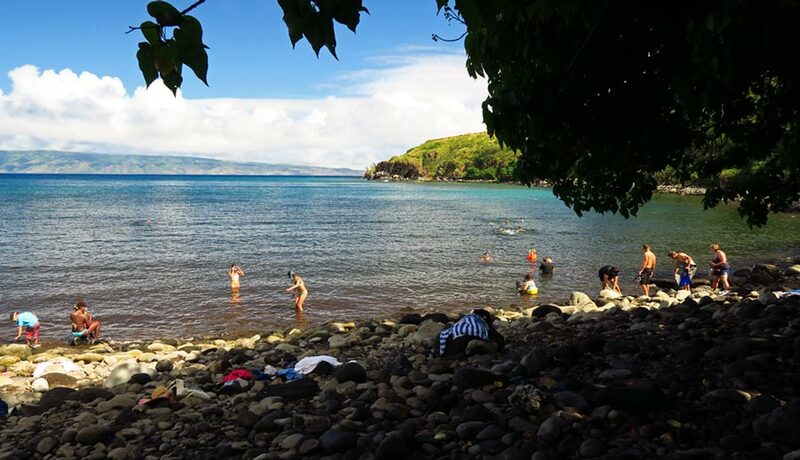 Honolua Bay is fairly big, requiring a half mile swim if you want to explore the whole bay. 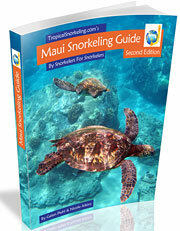 You may find it useful to drive past the bay on the road to get a view of the snorkeling grounds from the cliffs above. You may notice that the beach is made of boulders, and that the best snorkeling reefs are a bit of a swim from shore. Keep this in mind so you don't give up too early on your swim. 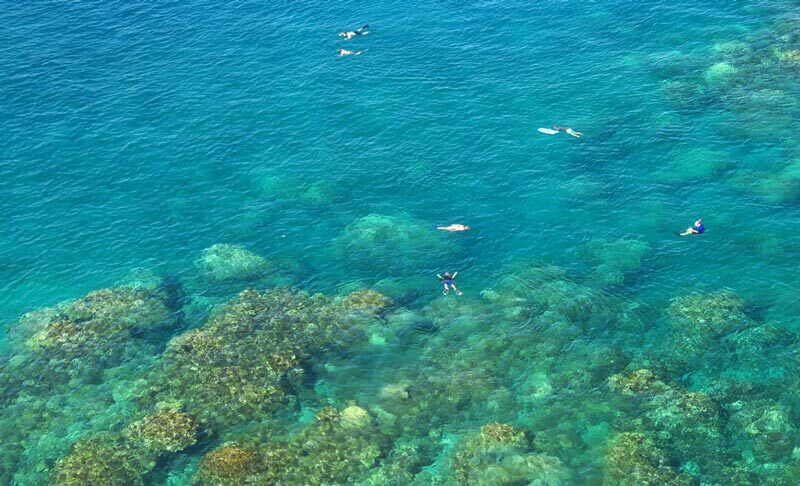 This snorkel spot is way up north on the west side of Maui, and it is worth the drive, or you could choose to book a boat tour instead. It can be pretty calm in this bay even when the trade winds are blowing up a snot out along the coastline. So if you cannot snorkel anywhere else because of wind and waves, this snorkeling Honolua Bay is a good bet. But, sometimes in the winter months the north swell can make this bay better for surfing than snorkeling, so look at a swell forecast first. Also reconsider your visit if there has been a lot of rain. Because if there has, the stream that enters the left side of the bay can make for miserable visibility. Be aware that this spot is very popular and that there are no facilities at the beach itself. Also, we advise not leaving anything valuable in your car. We have seen broken glass in the parking area indicating that your windows will not deter thieves. In October, 2014, the state of Hawaii purchased the land surrounding Honolua Bay. They intend to turn it into a state park. We did not see any signs of development or even signage on our visit in 2016. There are two trails to the beach for snorkeling Honolua Bay. They are both basically flat and will have some wading through the stream to contend with. 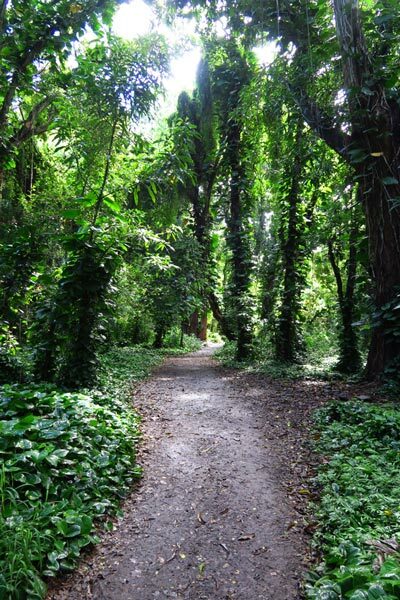 Flip flops or sandals are fine for these short hikes. The first trailhead is near the first bend in the road past the overlook, see the driving directions below. It is actually a dirt road that used to be the driveway for the folks who lived here. There is a gate that you walk around. This trail is a 700 foot hike to the beach. The second trailhead is just past the second big left bend in the road past the overlook. The porta-potties are near the second trailhead. This trail is a 1500 foot hike to the beach. Most people enter the water on the left side of the boulder beach because there is a little bit of sand. The problem is the Honolua Stream enters the bay on that side, and the visibility is often so low you can’t see a foot in front of you until you swim out quite a ways from shore. Here is what we like to do. To minimize this disconcerting low visibility, we like to walk along the rocks to the right past the old boat ramp and then enter the water. We find this entrance easiest in shoes because it is over rocks. The boulders are rounded and sometimes slippery with algae, so be careful. After entering, swim near the rocky shore on the right side of the bay until you reach the reef, about 600 feet from the beach. You will often see big catamarans dropping off snorkelers right in that spot. 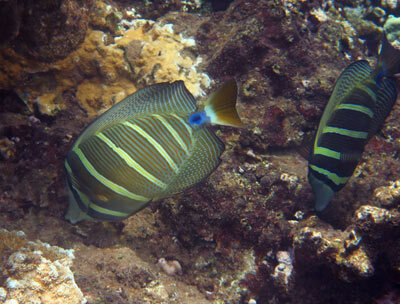 On the way to the reef you will be over a mostly sandy bottom with some fish to see. Once you reach it, you can swim over and along the reef for about another 700 feet out from the beach. This area has some fairly healthy and interesting corals in spur and groove formations that are fun to explore. 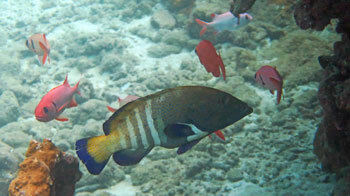 The reef is near the surface in places and is rarely deeper than 15 feet. There are tons of fish in a big variety here. The visibility can be excellent, or a bit low, depending on the waves, wind, and rainfall when you visit. 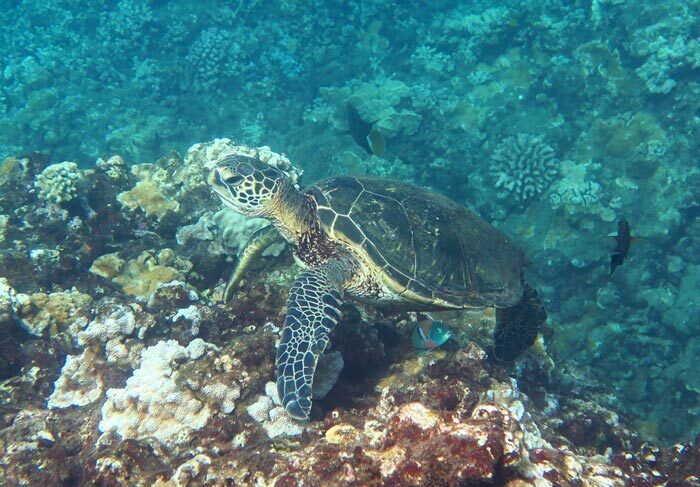 We have always seen some turtles while snorkeling Honolua Bay. As you swim out toward the edge of the bay, there is often an area where the surf breaks that you should avoid. This is where we usually start to cross the bay to the opposite side. Next, we like to swim across the middle of the bay to explore the left side on the way back to the beach. This crossing is over deep water, up to 50 feet or so, and a sandy bottom. You may not be able to see the bottom depending on the visibility. The swim is about 400 feet from reef to reef. Head for the rocky point on the other side of the bay. When you get close, you will start to see reef again, though it is more rock than coral on this side. You will swim over large rock shelves with a some interesting channels, and if you get close to shore, some fascinating underwater topography, including nice spur and groove formations, caves, and some huge boulders. We saw many fish on this side too. 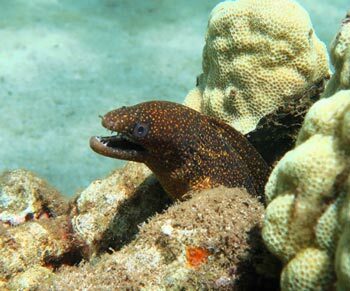 Check out this reef while you head back toward shore. The reef stretches about 500 feet along this side of the bay. The depths of the reef on this side go from near the surface to about 20 feet. When you get over the sandy bottom again on your way back to shore, you have another 500 feet to swim back to the beach. If the visibility is low, you may want to head back across to the other side of the boat ramp, where you got into the water, to exit again. 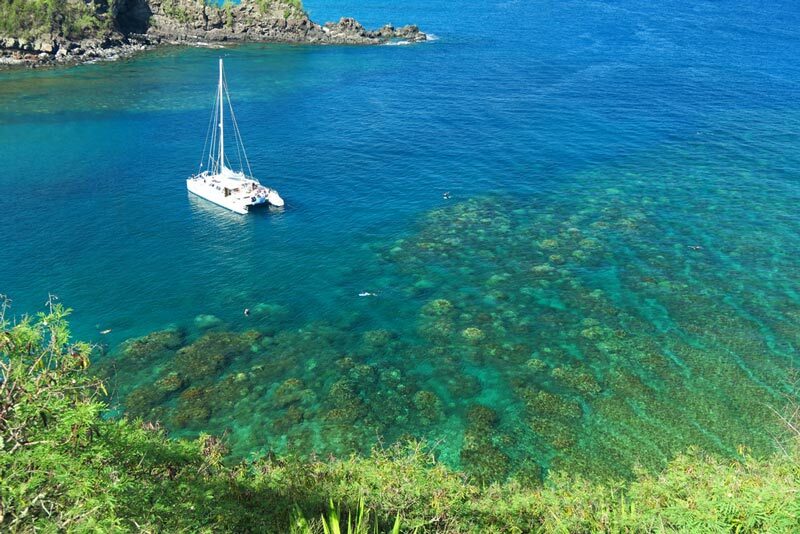 If you want to split snorkeling Honolua Bay into two separate snorkels with lunch in between, you could because the bay is large. Simply snorkel out one side of the bay and back, have lunch, then snorkel the other side. 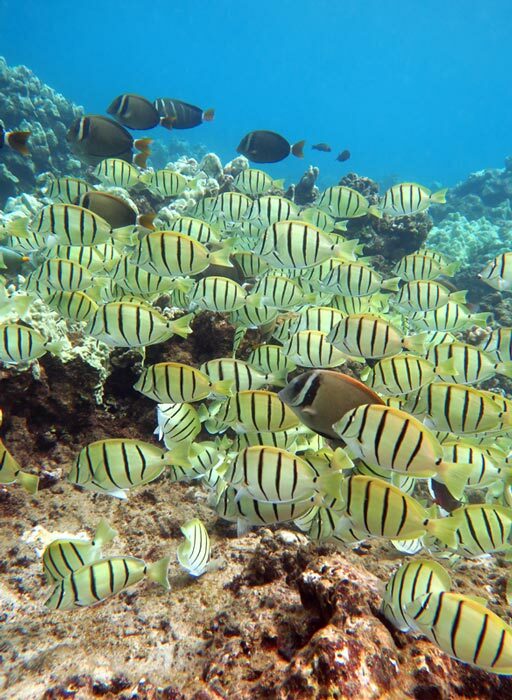 We saw many fish, including a large school of Bigeye Scad over the sand near the beach, and numerous large schools of Convict Tang. We saw four turtles on our last visit here, which is common. The corals here are diverse and in decent health, but there are numerous dead ones too. 3. Follow to the next intersection with Hwy 30 (Honoapiilani Hwy) and turn left, heading initially south. This road is what you will follow to the north shore of West Maui. You will pass by Lahaina, Ka'anapali and Kapalua. 4. After you pass by the Kapalua Resort area, you will come closer to the water again and pass signs for DT Fleming Beach Park. Past the 32 mile marker, there will be a turnout with a green chain link fence on the bluff which is Slaughterhouse Beach. 5. 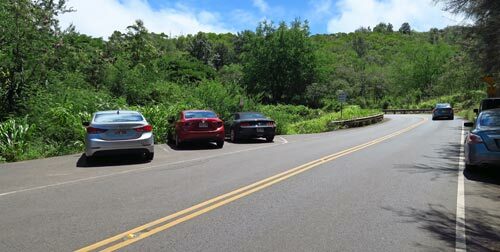 The next large turnout overlooks Honolua Bay, and heading downhill, before the curve in the road to the left is where you will start to see cars parking to use the bay (picture above). The first trailhead is around a gate at the beginning of a dirt road near where these cars are parked. If you keep driving down the main paved road, at the next curve to the left, there is a parking area with porta-potties. The second trailhead is behind these. If you continue driving, at the top of the hill there is another better overlook of the bay we mention above. There are porta-potties roadside. And, when we visited last there was a food truck across the street from the parking area that sold smoothies, lunch, and cold drinks.